Gift this Beautiful Avenger Designed Stationary Set to your loved ones and spread happiness. 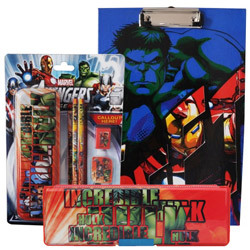 This Avenger Stationary Set contains Avenger Red Pencil Box with Attached Sharpener, Avenger Examination Board and Avenger Marvel School Set Packed with 2 Pencils, 1 Eraser, 1 Ruler, 1 Pencil Box and 1 Sharpener. Highlights of Pencil Box are Double Sides Open Design, Secure Magnetic-snap Compartments on Both Sides, Two Large Storage Compartments and a Pencil Holding Tray and highlights of Examination Pad are Tough N Colorful Body, Metal Clutch to hold Paper in Place, made of High Quality Board. Flowers Delivery Amravati, Send sweets Quilon, Wedding Cake Kolkata, Diwali Mithai Rishikesh, Send Flowers and Gifts to Cochin, Online Shop Chandrapur, Flower to Lucknow, New Year Flowers Renigunta , Fresh Fruits Tirunelveli, Send Gift Bilaspur, Dry Fruits to Kumbakonam, Birthday Delivery Thiruvanthapuram, Sending to Tanjore, Flower shop Shillong, Kozhikhode Online Cake Delivery.